Let's be honest: when you make a bag, you want it to be constructed well and finished beautifully - with that professional edge that sets apart homemade and handmade. 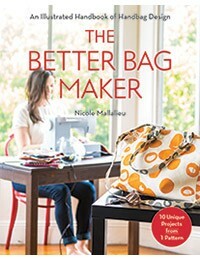 In this how-to book, accomplished bag maker Nicole Mallalieu reveals her high-end techniques, shortcuts, and secrets for professional design and finishes. Graded and ordered by degree of difficulty, the 10 featured projects teach a range of expert skills - from adjusting the proportion of the pattern to constructing pockets, straps, flaps, and bases. By the end of this book, you'll not only have a closetful of polished bags - you'll likely sew better than you ever imagined!